In a note, Jean Roody Aly the Minister of Justice, while recognizing the right of every citizen to demonstrate peacefully, deplores many drifts in the organization of these demonstrations and insists on the respect of the prescribed of the Constitution and conditions of realization of the latter "The Ministry emphasizes for everyone's attention the provisions of Article 31-2 of the Constitution relating to the prior notification of any demonstration on the public road, as well as the prescriptions of Article 2 of the decree of 23 July 1987 on public meetings stating that : Anyone wishing to organize peacefully a meeting or demonstration on public roads must give notice forty-eight hours before the meeting, to the police force of his locality. adding that the organizer is required to identify himself and provide relevant information on the proposed public meeting. 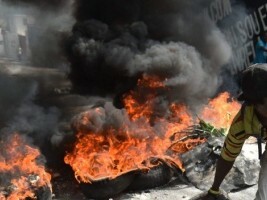 Minister Aly, prohibits all spontaneous and violent demonstrations, capable of harming the lives and property of others while calling on the National Police of Haiti (PNH) and the Public Prosecutor to act and sanction all troublemakers.